Nicole's Needlework: Progress and a Prize! I was able to get a little bit of stitching done on CaHRH since my last post. I finished the red bird on block 10, got a little bit more filled in on block 11, and got a small start on block 9. I also got a package in the mail from Jolene today. I won one of her very generous giveaways. 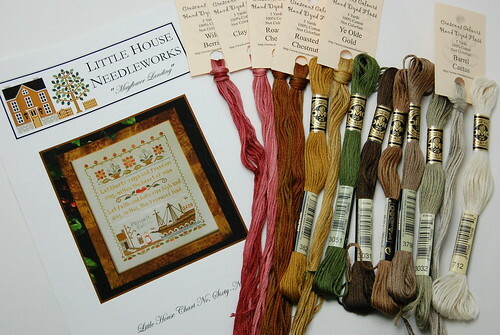 Little House Needleworks "Mayflower Landing" and threads. I just love this pattern. I was so excited to receive it from her. Thank you again Jolene!! Looking fantastic, as always. And I too love Mayflower Landing. I should be receiving the pattern any day now in the mail. What a lovely gift to have gotten! Your Christmas Hawk Run in looking great. I am so loving your Christmas HRH! 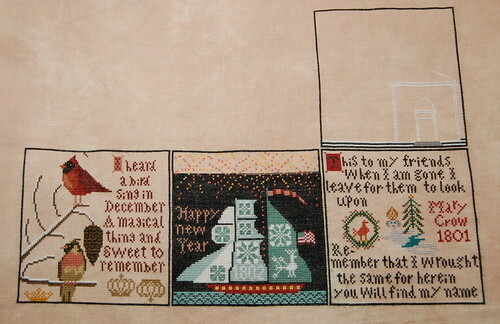 I have visions of someday stitching the "Bird at December" block (Is it 10?) as a pinkeep! But, that's a loong way away; I don't even own the pattern! BtSS is continuing apace; though the last bits do seem to be slow. I think I'm fussing too much over the smyrna cross berries (Not difficult, so don't know why) in the border. After that all that remain are the date, windows, roof, and 2 small quaker emblems I'm considering subbing out for personalization. You are cruising along! It's so pretty, and as I see you work it up, I've decided that the bird block is my favorite. What a nice giveaway--I really like that LHN chart! Congratulations Nicole - what a wonderful prize! CHR is beautiful - I love seeing your progress. Beautiful progress! And your prize -- I love that design! Lucky you! Very pretty Nicole...smoking needles as usual I see! You are just zipping along on CaHRH. It looks wonderful. Woo hoo... lucky girl winning such a lovely prize. You are making excellent progress on Christmas Hawk Run Hollow, it looks fantastic! Congrats on winning Mayflower Landing, this is on my stitching list too. Congratulations on winning that fabulous prize. And wow, I think Block 10 must be my favourite so far! Nicole, you're zooming along so nicely on this! Great job. I love that cardinal block. Congrats on winning one of Jolene's giveaways! Beautiful progress Nicole! Can't wait to start mine. Great prize and love, love, love your CaHRH! Love watching your progress! I have a friend who is stitching from the 1st to the last and so I'm getting the benefit of both! It is a fabulous piece! Enjoy!